Any fertile, well drained soil that holds moisture well. Time planting so that rutabagas are reaching maturity just as the first fall frosts arrive. 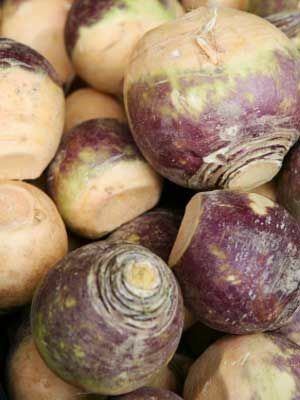 Cold weather improved rutabaga flavor and texture. Chives, Onion, Onions and Peas. Sow seeds half an inch deep and 4 inches apart in early summer. Thin seedlings to 8 inches apart when they are 3 weeks old. Needs more water than many other vegetables. Mulch to keep the soil cool and moist. Harvest in mid to late fall, after the soil has cooled and frosts have become frequent. Trimmed roots can be stored in a cool basement, root cellar, or refrigerator. Rutabagas left in the ground too long become woody.